My father, John Chancellor (1925-1984), finished some seventy oils in his professional painting career, many of which portrayed British naval sailing ships from the Napoleonic period, requiring significant research and months at the easel. He preferred watercolour for simpler pictures of the working sailing vessels which he knew intimately, some of which, such as Thames sailing barges, he had sailed himself. 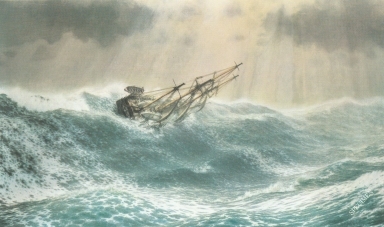 There are two books about his work and prints of some of his best paintings are available from www.chancellormaritimeprints.co.uk. Chancellor was reluctant to paint the Beagle as she had been so extensively modified for surveying and very few contemporary illustrations were even moderately accurate. In 1979, however, with the then approaching Darwin centenary (1982), he struck up a lengthy correspondence with David Stanbury, adviser to the BBC's 1978 TV series 'The voyage of Charles Darwin', and with Lois Darling, who had built a detailed model of the Beagle. After reading Stanbury 1977 and 1979, then FitzRoy's Narrative 1839, he finally decided to commit to a painting of 'H M S Beagle in the Galápagos'. The painting involved much original research, and Chancellor and I spent many hours poring over the charts and watercolours made by the crew, at the Hydrographic Office in Taunton. 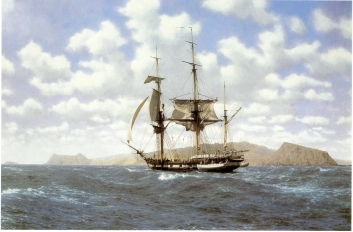 After reading FitzRoy's log, Chancellor chose to portray the Beagle on the afternoon when FitzRoy sent in boats to collect Darwin after his longest period ashore on the Galápagos. The painting was finished in October 1980. In July 1981, through the kindness of the Captain of the M V Santa Cruz, I visited the exact spot depicted in the painting, and was able to confirm the accuracy of the landscape background. Chancellor had copied this from B. J. Sulivan's sketch made in the yawl some weeks before the Beagle crossed the same spot. Sulivan’s sketch has been reproduced in Keynes 2003, pp. 322-3. The painting itself consumed over 750 hours at the easel, but I know Chancellor was pleased with the result. It was printed by Alexander Galleries in 1982, and purchasers were provided with a leaflet in which Chancellor explained the background to the painting. A shortened version of that account was included in The maritime paintings of John Chancellor (1984), a book which sadly Chancellor never saw published as he died suddenly a few hours after checking the proofs, in April 1984. That book includes an excellent biography, by Austin Hawkins. Chancellor also executed an ink drawing of the Beagle, which appeared in the book, showing the ship from the starboard side with the two boats returning with Darwin on board. I am the proud owner of the original drawing. Chancellor had already painted a second oil, 'Sorely Tried', showing the Beagle at another critical moment, which was made into a print and was featured in John Chancellor's classic maritime paintings, by Rita Chancellor and Austin Hawkins (1989). Although it is not dated I believe this previously unpublished essay was written in 1980 or 1981. Chancellor had originally intended to submit it to The Mariner's Mirror, but in the end he decided that the article Lois Darling had been preparing for Sea History said most of what he wanted to say, and he filed his article in his 'Beagle box', a file which I now possess. Darling's article appeared around the time Chancellor died, but I kept up correspondence with her until she too died not long afterwards. I present my father's essay now, I believe that if he had lived to see Darwin Online, I could have persuaded him to have done so himself. I have preserved Chancellor's wording. He quotes from Slevin 1959 who printed transcripts of various manuscripts and I have preserved Slevin's spellings even though in one case ('skirketting', which is usually spelt 'spirketting') I believe Slevin may have misread the manuscript. I had the pleasure of working with Keith Thomson around the time Chancellor was painting the Beagle, and was of course aware of Thomson's research on the ship. The two men never met, however, and it is sad that Chancellor never had the benefit of seeing Thomson 1995, a book which would have saved him a considerable amount of time.